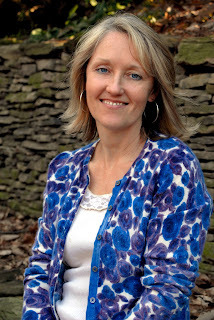 The Compulsive Reader: Interview with Amy Brecount White! Amy Brecount White is the author of Forget-Her-Nots, which is a story about a girl with a special kind of magic when it comes to flowers. You can click here to read my review. Below is a short interview with Amy! TCR: What got you interested in writing a book in which the meanings of flowers played an integral role? ABW: When I was freelancing for newspapers and magazines, I was always on the lookout for original stories. So when I found out about the language through a beautiful book, I knew I had something. Plus, I’m a big time gardener. Flowers are so hopeful, too. They can brighten a room or someone’s face. 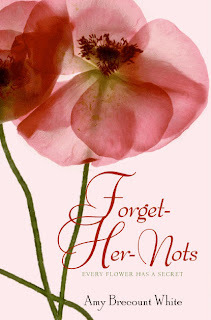 TCR: In Forget-Her-Nots, the love of flowers is passed down from generation to generation in Laurel's family. Is your interest in flowers something you share with any of your family members? ABW: Definitely. My mom, both my sisters, and I all love gardening. We visit gardens and conservatories together. We share ideas about what to plant and what looks amazing in our own gardens. And we’re trying to pass that love on to our kids, too. TCR: What sort of research did you do for your book? ABW: I read lots of language of flowers books and online sites – there are many versions – and I even read a few academic books about the Victorians. I spent a day at the Folger Shakespeare Library in DC reading about Shakespeare’s use of flowers. (Yes, that was my cell phone that they confiscated.) And anywhere I go, I check out the flowers and see if they have a scent. I do stop and smell the roses. Every season, I try out new flowers in my own garden too. TCR: What was the hardest part about writing Forget-Her-Nots? ABW: One of the hardest parts of writing a novel is getting the plot and pacing right, especially with YA novels. Adult readers are a little more tolerant of slow openings and digressions. YA writers have to draw readers right in and keep their attention. It’s a lot of work and revision. ABW: I really enjoy writing descriptive passages and dialogue. And I loved being in the world of FHN whenever I wrote. I hope to revisit the world of Avondale in a companion novel one of these days. TCR: Do you have a favorite flower (or flowers)? ABW: I really do love all flowers – pansies, gardenias, lilies, and dogwood trees, especially. It’s so amazing for me to await the unfolding of each bloom. In my own garden, I try to have something blooming from February through November. Sometimes my camellia blooms in the winter, too, which makes me smile. Now, keeping up with Amy's contest, I give you all purple tulips--they mean "royalty", so see what you can do with that! I chose them because I have a vase of purple tulips sitting on a bookshelf, and they are so pretty--they embody Spring! Great interview! I really like how this story is about flowers, too :) I'll have to read it soon. Great interview. I bet your garden is really starting to pop up now, mine is! Great interview. 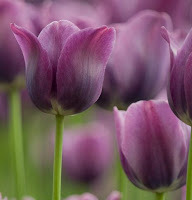 I love flowers like the purple tulips that are not in colors you see everyday. These are such a rich dark purple they look like royalty themselves. another great interview. the purple flowers are royally epic, love em! Great interview! I've heard people mention the language of flowers, and I wish it was used more frequently. I love flowers, and I wish I knew more about the meaning behind each. I'll have to look into it.